An addictive spicy sauce that gets its “kick” from gochujang dresses up Grilled Cabbage Wedges with a Korean Glaze… This grilled cabbage is anything but bland, and super easy to make! March is fast upon us, and with March comes St. Patrick’s Day and cabbage. Well, maybe more than just cabbage 😉 – Irish stew, chocolate stout sorbet, colcannon, corned beef… to name a few. Do you get excited about cabbage? I must confess to a struggle to work up enthusiasm for this pale, bland-tasting vegetable. In that spirit, I set about creating a simple cabbage side dish that would be anything-but-bland. 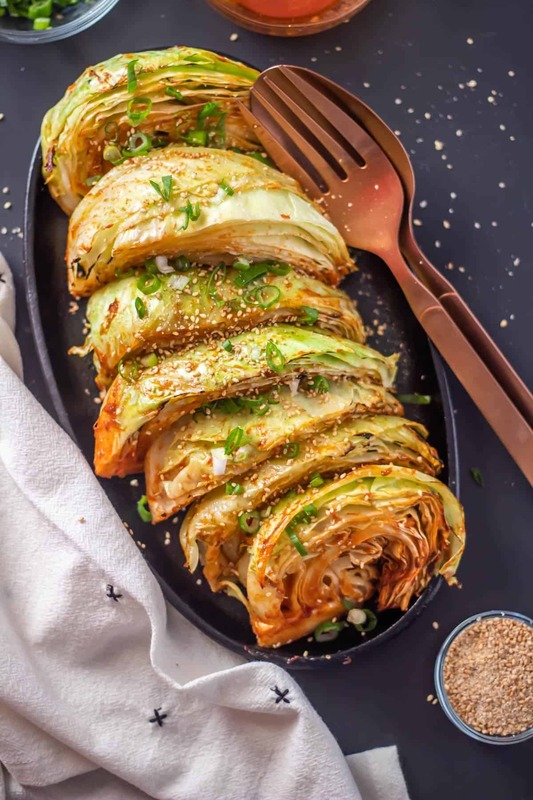 Grilled Cabbage Wedges with a Korean Glaze pairs perfectly with teriyaki chicken thighs or grilled pork chops. Prior to working on this recipe, I had never even considered grilling cabbage, but why not? A little char adds complexity and flavor to so many simple foods. My first attempt at grilling the cabbage involved cutting it in wedges, and grilling it raw with a sauce that was quite a bit thicker than the one that made the cut and ended up in the recipe. The cabbage didn’t get tender, and the sauce kind of just sat on the top. However, we did love the flavors, so I refined the recipe. The key to crisp-tender results is to lightly steam the wedges prior to grilling them. For the most part, they hang together (if they’re handled carefully). The loosened-up consistency allowed the glaze to drip into the cabbage wedges, and more of that spicy umami-rich gochujang glaze equals more flavor! I may still make corned beef, cabbage, and colcannon, but having a new (and more flavorful) way to prepare it is always a good thing. Cabbage is a cruciferous vegetable (broccoli, kale) not a lettuce. The sulforaphane found in cabbage may help protect against cancer. A compound in cabbage may offer protection against radiation. In fermented form (kimchi and sauerkraut), cabbage has benefits that range from boosting immunity, to fighting inflammation, to preventing constipation. Cabbage is low in calories and carbohydrates, and contains good amounts of several important nutrients. Take away? A varied diet is a healthy diet. Learning to love (and eat more) cabbage is good for you… What do you say? 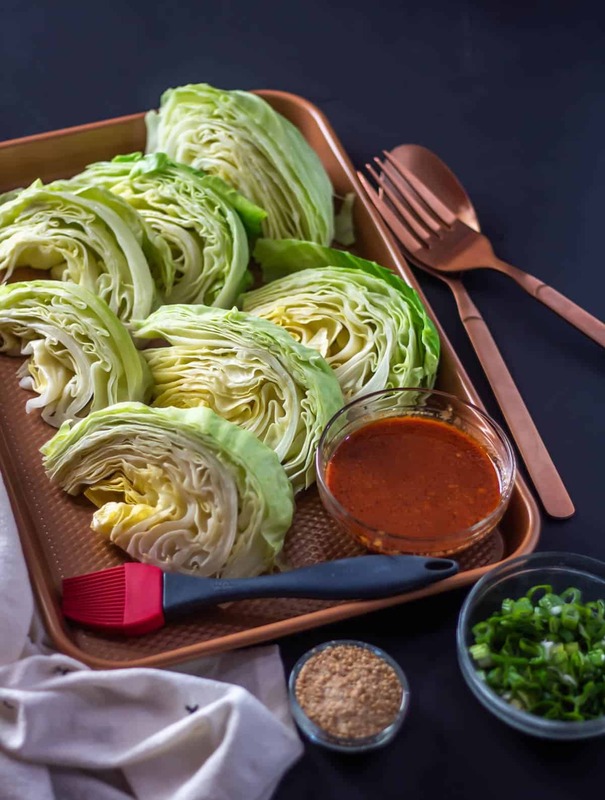 An addictive spicy sauce that gets its "kick" from gochujang dresses up Grilled Cabbage Wedges with a Korean Glaze... This grilled cabbage is anything but bland, and super easy to make! Cut the cabbage into wedges leaving the core intact to hold it together. We cut our medium cabbage into 8 wedges. While the cabbage wedges steam, add all of the Korean glaze ingredients to a prep bowl, and whisk them together until smooth. 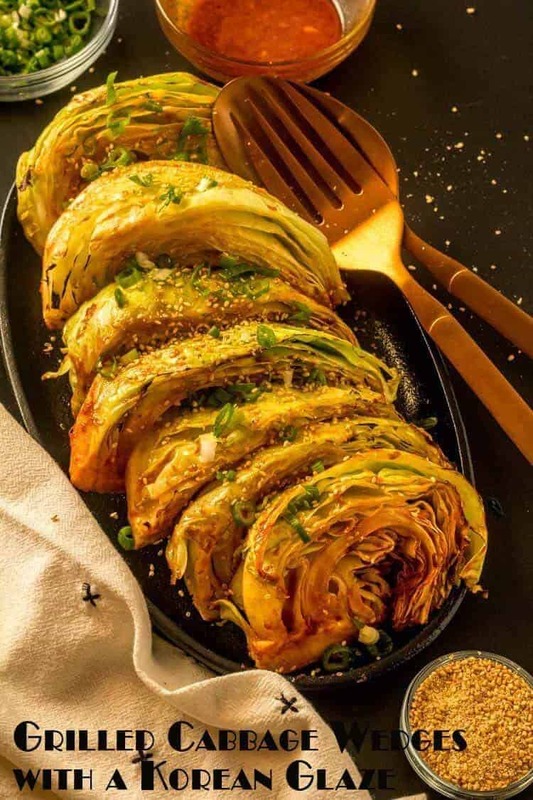 Arrange the crisp-tender cabbage wedges on a grill pan over medium-high heat. Brush generously with the glaze. Cook until you see a bit of char on the edges of both cut sides, continuing to brush with the glaze. Depending on the temperature of your grill, this process takes 10-15 minutes. To Serve: Carefully arrange the wedges on a platter or individual plates, drizzle with any remaining glaze, and garnish with chopped scallions and sesame seeds. 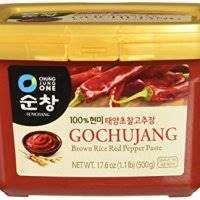 Gochujang is a spicy, thick, slightly sweet red chile paste with tons of umami flavor that is the flavor kick in Korean dishes like bibimbap and kimchi. There is no substitute, but it has become much more widely available in "regular" grocery stores. Tamari includes very little or no wheat. 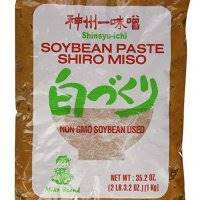 Soy sauce contains wheat. Choose a gluten free tamari sauce if following a gluten free diet. Tamari has a darker, richer, and more complex flavor than soy sauce, but soy sauce is a fine substitute (unless you're avoiding gluten). 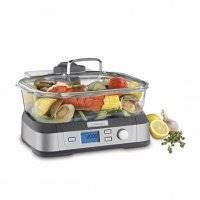 This appliance makes steaming the cabbage wedges quite easy. I have had one for years, and actually use it regularly. The wedges have to be handled carefully to keep them intact. Macronutrients (approximation from MyFitnessPal): 64 calories; 2 g protein; 11 g carbohydrates; 2 g fat. Trying this tonight with some galbi and grilled sweet potatoes. I love all things cabbage, so if it can satisfy a cabbage-hater, I’m sure this will earn its place in my grilled veggie rotation! I've never been a big fan of cabbage, but this dish really stands out. The gochujang glaze, plus the slight char from grilling the cabbage wedges, really makes it special. Serious understatement darling ;-) You don't like cabbage at all, but you did enjoy this dish!